Near Des Moines alone, snow totals have varied with Adel receiving less than 2 inches but Norwalk getting more than 4. As snow began to slowly taper off, traveling in parts of Iowa remained hazardous Saturday morning after a bitter cold, biting wind and constant snowfall moved into the state Friday afternoon. While the storm began to move out of the state, a winter storm warning remained until noon Saturday in more than a dozen southeast Iowa counties, covering cities such as Cedar Rapids, Iowa City and Mount Pleasant. Driving conditions were dangerous and slick there in the morning from drifting snow and patchy freezing drizzle. The National Weather Service issued a winter weather advisory in another six southeast counties, including Monroe, Wapello and Appanoose, where light snow accumulation and ice was expected. In addition to slippery roads, blowing snow might significantly reduce visibility, especially in rural and open areas, meteorologists said. There were tow bans in 39 counties — more than a third of the state. The Iowa Department of Transportation warned travelers Saturday: "That means if you go in the ditch, your vehicle will stay there until it's safe for tow trucks to work." To clear the snow, state transportation officials said they had nearly 500 plows deployed throughout Iowa. During the last 48 hours, the DOT estimated it cost more than $1.3 million to run the plows, which included $680,000 for materials and $350,000 for labor. In the Des Moines metro, meteorologists said the snowfall varied from 1.5 inches to 4 inches, which was measured Saturday morning in Des Moines’ Beaverdale neighborhood. Northern Iowa saw some reports as high as 10 inches. In central Iowa, the precipitation was done when most wake up for the weekend. "The wind and cold will be the story Saturday," said Brad Small, a National Weather Service meteorologist. Temperatures started in the teens Saturday morning and won't get much higher. Gusts were expected to cause single-digit wind chills throughout the day. Saturday night, temperatures could fall into the single digits, with the wind chill dipping near 10-below. The NWS said cold wind chills of 10 below zero to 20 below zero were expected Saturday night into Sunday morning in more than 40 of the state’s 99 counties, including Dallas, Polk and Jasper. As snow started falling Friday afternoon in downtown Des Moines, the National Weather Service warned drivers the increasing snowfall would have serious effects on the evening commute. Many roads in the metro were "completely covered" as of 8 p.m., according to the Iowa Department of Transportation. A traffic jam was reported on Interstate 80, west of the metro near Mitchellville. Iowa State Patrol Sgt. Nathan Ludwig said there were 43 crashes across the state from 9 a.m. to 9 p.m. One crash in Muscatine County was fatal, but he had no additional information. There were 90 calls for service in the same period. In Des Moines, officers responded to 27 motor vehicle crashes between Friday afternoon and 4 a.m. Saturday, Sgt. Paul Parizek said. No one was injured; five of the crashes were reported as hit and runs, he said. Power outages were rare around the state with Alliant, MidAmerican Energy and the Iowa Association of Electric Cooperatives each reporting fewer than 10 customers without electricity. Northern and eastern Iowa were hit the hardest. Counties such as Allamakee, Winneshiek and Winnebago saw much more snow than Des Moines. Small said as of 7 p.m. Friday, the snow was just about done near the Minnesota border, but places such as Mason City and Decorah had seen nearly 7 inches. West central Iowa did not receive much snow but got freezing drizzle throughout Friday night, making for low accumulation and slick roadways. 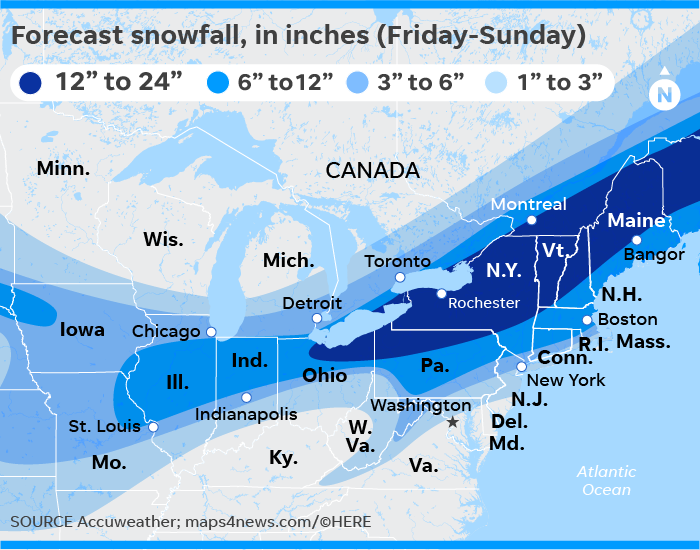 The location determined the type of snow, according to meteorologists. Snow in northern Iowa was more light and fluffy and prone to blowing. But snow in southern Iowa was wet and heavy, the NWS said. In Des Moines, meteorologists said the wind chills would hit 12 below zero, with colder weather up north. Up in Estherville, in northern Emmet County, expected to be one of the coldest parts of the state, the NWS said the biting wind chills would hit 12 below zero. In Lyon and Osceola counties in northwest Iowa, wind chills as low as 30 below zero Saturday morning could cause frostbite on exposed skin in just 30 minutes, meteorologists warned from Sioux Falls, South Dakota. Temperatures are expected to stay low Sunday as well. Looking ahead, meteorologists said snowfall Tuesday could bring light accumulations in the southern and central parts of the state and moderate accumulations in northern parts. It was becoming more likely, the NWS said, for “bitter Arctic cold temperatures” and wind chills to return to the state Thursday and Friday. This story will be updated throughout Friday and Saturday. Check back for updates.